The answer is NO. We ascribe to and follow these almost dead "call them zombies... perhaps" beings that make us believe this is the way it is to be. But, we are not actually enslaved or trapped, we hold the keys to our imprisonment... all we must do is unlock the cell of illusion that others have made us believe that this is all there is. Once again, "We Are The Creators... We Are Man": And we have all the equipment and natural resources within us to free ourselves from the "Daymaire" of waking life and move into the World Of Our Own Reality... and Live Our Dreams. Life is not that, that we are being told it is... Life Is Freedom and Continuous Movement. We must create the world we want to live in and the life we want to be ours. I created this composite image from my photo of this section of Michael Angelo's Sistine Chapel Ceiling when thinking how ~ We ~ "Mankind", are the most abundant creators on Earth and perhaps anywhere in the universe... if there is more out there; and, that Creativity Is A Basic Human Right given to us at birth. In studying the image further I began noticing the similarity in appearance of the image where "God" is seated... resembles a cross section of the human brain. Apparently however, I am not alone in this discovery, for shortly after I stumbled on this I found several others who had also noticed this similarity, and commented on it. Is not it a bit interesting that this symbolism may have been intentional, or at lease a sign of some awareness as to the powers of the creative mind and the passing on the gift of creativity to man. 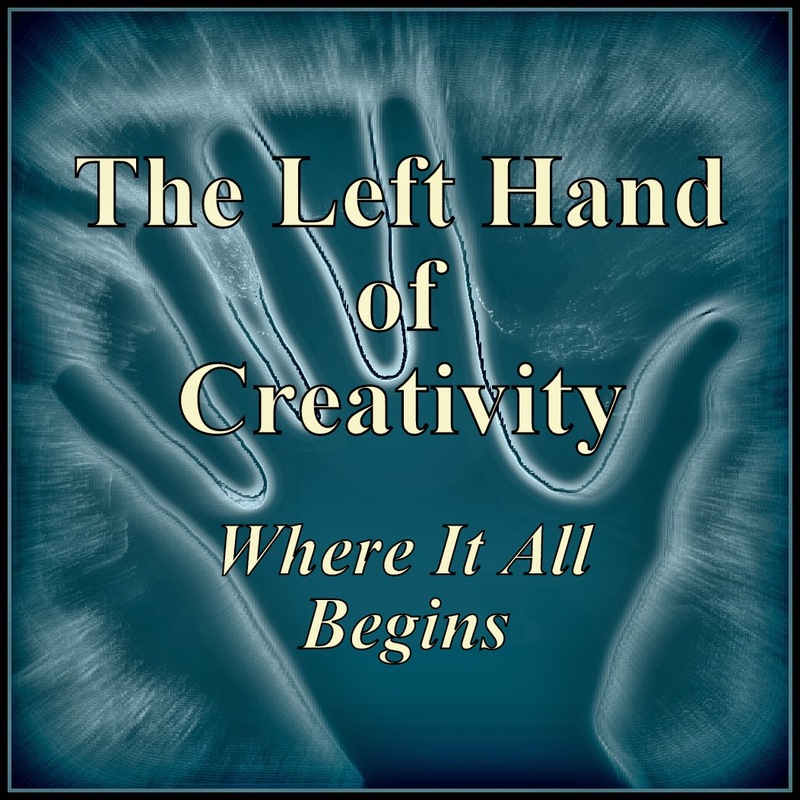 Left Hand", that hand which known today (not then it may be assumed) to be associated with the "right side of the brain"... that part of the brain... that is the creative side of the mind, the side which perhaps does receive all inspirations (in-spirit). This area of the brain is associated with designs, images, forms and three dimensional space... such as the graphic positions and placements and movements of fingers on string instrument necks, and particular those clusters of finger placements known as chords. Even more importantly is that this section of the brain is connected to the resulting sounds that we call music and it's multi-dimensional characteristics... especially that of harmony. Music seems to float like holographic images in sound, filling the space around us, and although we cannot actually touch, taste, see, feel or smell... affects us just as if it were an actual physical object. This thing we call music... is a landscape or "Soundscape" an image built from vibrations that seem to float through the air, with characteristics very much like tangible objects we encounter daily... with dimensions and measurements not unlike things in the visible world. Music is not just a linear stream of events as most listeners experience, or for the most part as seen when reading a piece of music. Music Is Sculpture In Sound... it has shape and form... experienced just as other objects are when on a journey... that one looks upon and then moves on to the next. Music is like a motion picture in sound... instead of vision, taking us on a journey as we listen, leading us to where it wants us to go... but yet allowing us the most extensive levels of personal interpretation... instead of a concrete, static image as with the visual world, that always remains the same... except perhaps if we are under the influence of some substance. Additionally, the very nature of a multi-stringed instrument's neck such as the guitar with it's frets and even the violin family without frets... is a horizontal and vertical grid, and can be seen as is Earth itself with it's latitudinal and longitudinal delineations. It is along this neck that we find the sounds that result in the music that flows from the players hands as such "sound images", just as if they are solid forms. The physical instrument is only a tool for producing the sound and the fretted neck, acts as a road map to where their locations can be found. As the locations on a map are not the actual places, the "graphic" locations on a string instruments neck are only locations where we can find what we need to create and experience the music. 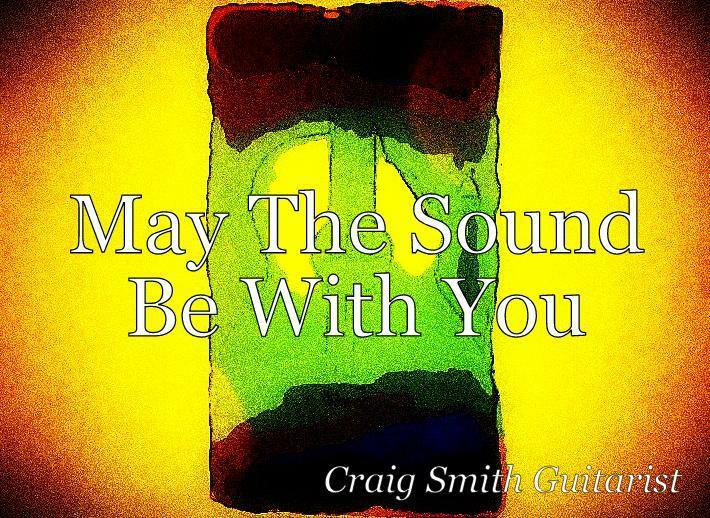 The guitar... with it's horizontal strings and and vertical frets allows us to access these sounds with our mind functioning similar to a GPS device navigating through this environment of sound positions and places to reach and discover what we call music. We are all explorers on an endless highway taking us on this journey of music as we create or as we play and even as we just listen, for the music is both our guide and our adventure. 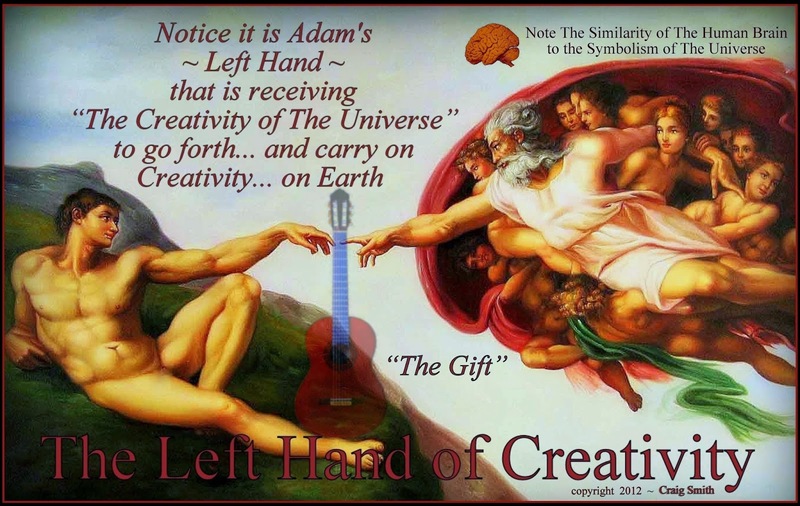 This is the hidden, secret and natural connection of the Left Hand to the world of music from the strings of all such instruments... and the creative spark handed to Adam... depicted in the Sistine Chapel's Image. It is by no mere coincidence, or accident that the left hand is the chosen hand on string instrument necks for thousands of years. 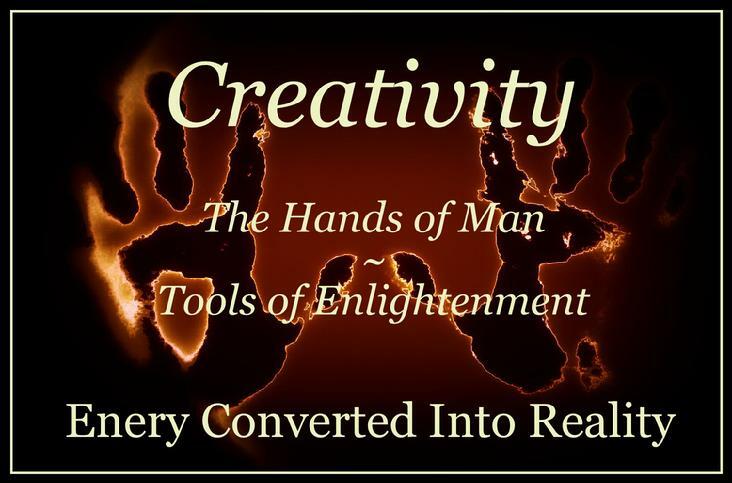 It is The Hand Of Creativity. 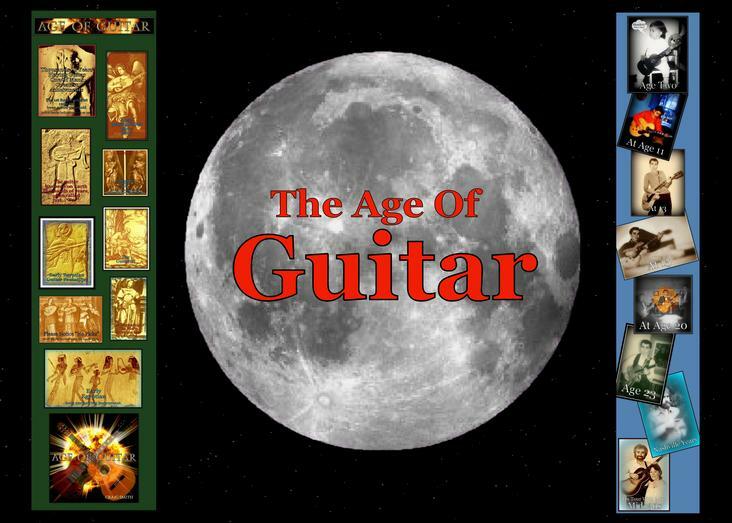 Finally, I added an image of the guitar to emphasize this point, and called it "The Gift". 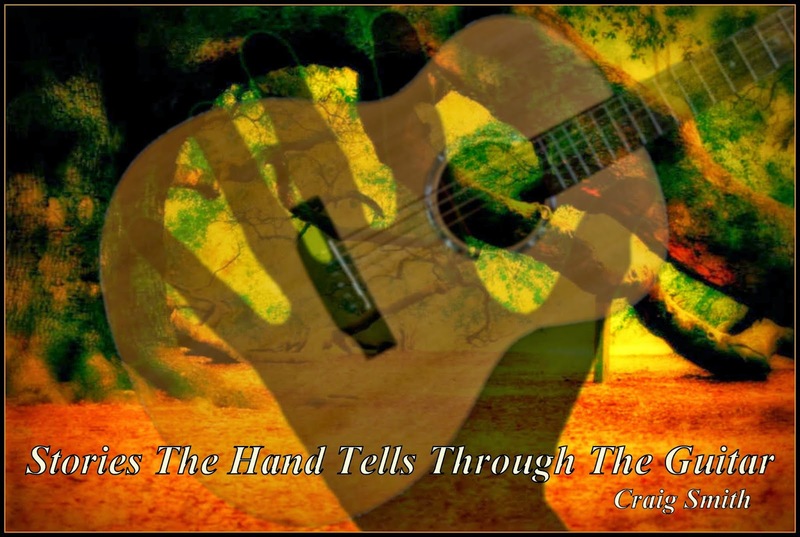 I did this not only because I play guitar... and that the Guitar is truly a gift to me. It is because the string instrument family is this gift and as a whole... favors left-handedness. Is this any wonder... since the left hand is predominantly controlled by the right side of the brain... the hemisphere related to design and graphic patterns as in music... and in particular the structure of harmony. In addition, the origin of our most familiar string instruments is from that area of the world we have come to call "The Cradle Of Civilization"; and, at that time at least, the inhabitants of that region were predominantly Left Handed. This is evevident from that they wrote with their left hand from Right to Left and creating alphabets... which are also read right to left even today; as with Arabic and Hebrew, and many others. These alphabets incidentally are generally more design, image centered... rather than linear as are many other alphabets of the western world... and right handedness. In fact the shapes of many alphabets that were born out of predominantly left handed cultures are often more artistic in their shape with more natural curves rather than the straight lines and loops in alphabets created by mostly right handed people. It's also important to notice that the music of these same originally left handed cultures often has more shaped and bent tones and slides in or out of various notes, and even additional tones not appearing in standard notation; as well as often unique, multi layered rhythmic elements. Also, still today the majority of string instrument players use their left hand on the neck of their instruments... guitar, violin or otherwise. Of course there are exceptions to this... and if one chooses they may play such instruments with the right hand on the neck, just as there is in other examples of right or left handedness in the world today. However... look at the string section of an orchestra and it's doubtful you will see a reversed violin. This is not because of requirements of orchestras, or because all violinists are right handed... it was because from the beginning the natural, original tendency of the left hand being associated with the graphic layout on the neck and the essential producing of the designs we call music... an association embedded much deeper in human history than we imagine. 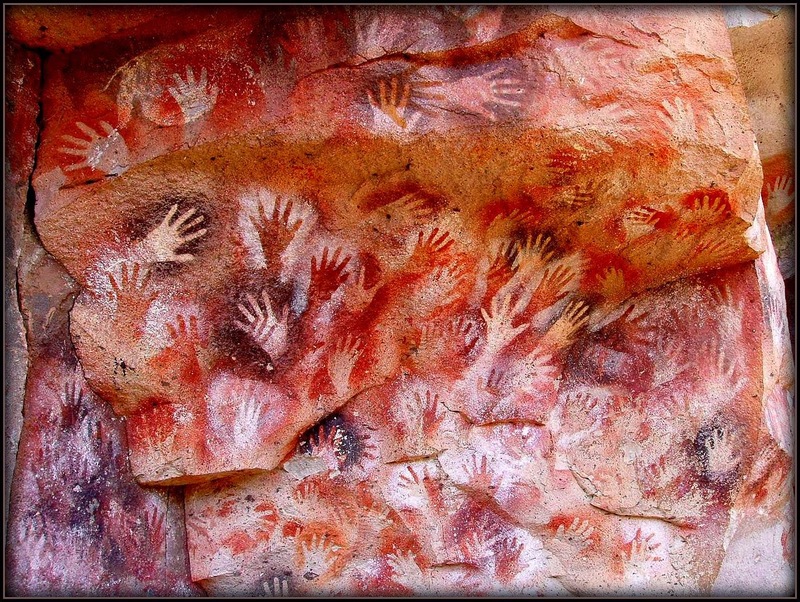 In fact, extending back in to pre-history as we are finding it today in many ancient archaeological discoveries it is the left hand, not the right hand more frequently appearing on the walls of caves and other primitive art. One can make his or her own decision, but must be very cautious not to just arbitrarily buy a left handed guitar just because they are themselves left handed. In fact... they might better recognize that they may have an advantage being left handed and play the instrument with that hand on the neck as the tradition was past down through the ages... for the left hand is still in the domain of the right side of the brain since the dawn of time. Thus the left hand... as depicted in the original Michael Angelo... is the hand used even today predominantly by players of string instruments worldwide on the neck... was the hand of choice by the creators of string instruments from the earliest times. It is interesting that in a time when nothing was known of the brain and it's two hemispheres, the ancient developers of string instruments instinctively placed the neck on that side of the body most naturally connected to those holistic, graphic elements of music. Ancient man was not trying to create a music playing device, not trying to play all his popular tunes, what tunes? 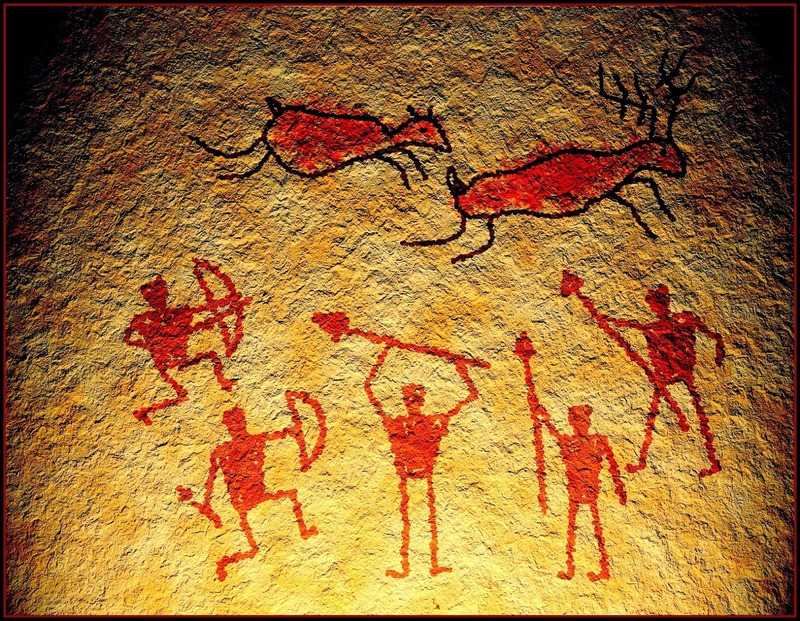 Ancient man was in search of sound... how to make different sounds, originally often for the purpose of getting food in hunting imitating the sounds and calls of other living creatures to lure them. It is also important to mention that the primitive hunting bow was not only a tool for the hunt... but also a sound producing device and was in essence a one string harp... marking the beginning of our string family. And, ancient images most frequently depict the wood bow in the left hand and the string being pulled (or plucked) with the right. This bow itself was later to acquire additional strings and eventually the curved wood was also flattened to become the neck of our guitar's earliest ancestors. This primitive instrument also deepened the importance of music in mans quest for survival and was deeply connected to the act of early worship of a higher power, showing the importance of music in what today we call religion. 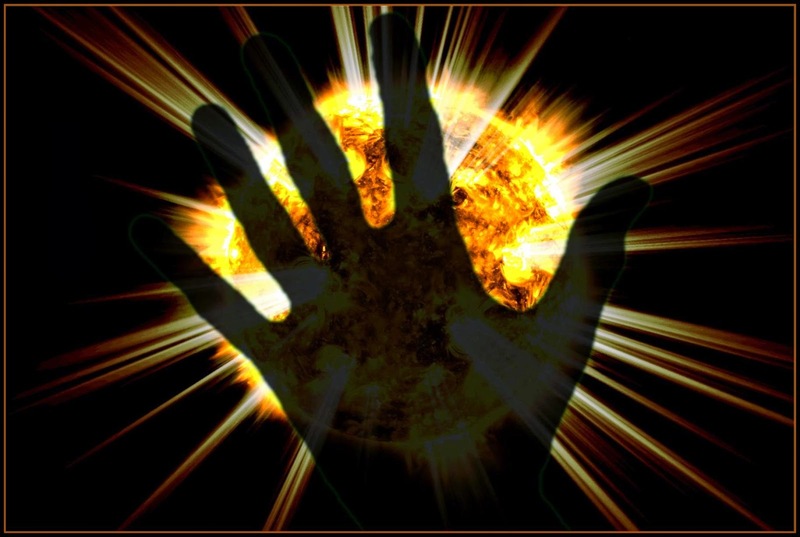 "We Are Creators... We Are Mankind"
There has always been the thought from the earliest of times that something was "Out There"... the image of a supreme creative force, A Creator, "God", that we could in some way communicate with. 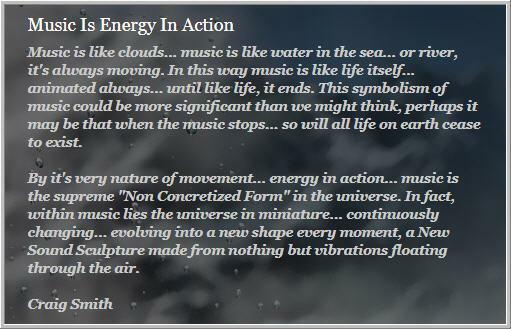 So it is also with music... one of the earliest means developed for this need to communicate on the spiritual level. Yet, we are all creators ourselves... made in the Image... if you wish to say, an image within ourselves and all mankind. 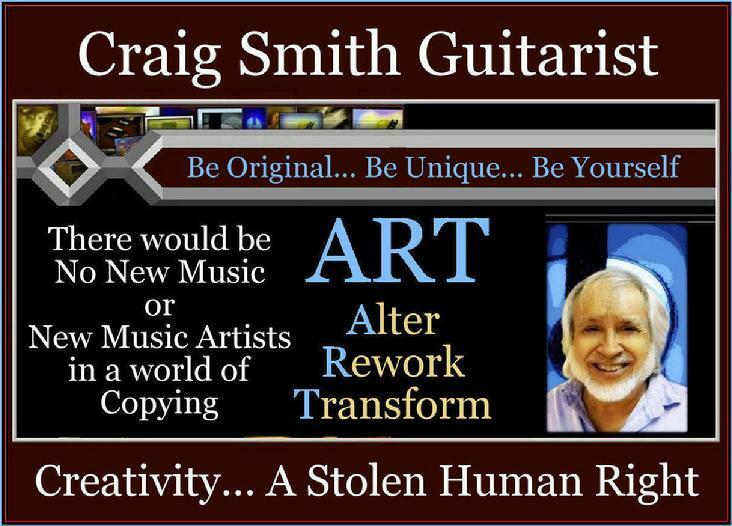 "We Are Creators"... we can make our world become practically anything we choose right from within us, it is our greatest gift and basic human right as stated above. Music comes from within us, the sound is not out there... it is within you and me and everyone on the planet. The player of music has endless ties to the infinite world of creativity as depicted in the image on the ceiling of the Sistine Chapel, in fact it is the concept of the string itself on all string instruments, that symbolizes this connection, a direct tie to the source. We musicians and it's listeners too, are all explorers of an endless, unlimited and infinite universe of sound. Music leads to new Soundscapes, new frontiers... on a journey within ourselves to discover the secret of life itself... Creativity.